Nutritionally, there will be little to no difference - freezing is generally done as soon as the fish is prepared - gutted and filleted - the 'fresh' fish you see on the fishmonger's counter may be several days old. It will have travelled from sea then from the ports to the shop, then it sits in a fridge until it goes onto the counter, then back to the fridge if it hasn't sold and so on for a few days. Frozen fish contains the same nutrients, oils, proteins, minerals and vitamins as fresh. It is often cheaper and the main reason for that is because there is no need to factor in any spoilage from not being sold. It will keep for a few months in its frozen state, whereas fresh will sometimes be wasted due to it not being sold from the counter. It also only needs frozen transportation whereas fresh needs different types of refrigeration at each stage. The consumer takes advantage of any gluts in supply as the excess fish can be frozen and stored relatively cheaply for a lot longer than fresh. Another advantage is being able to eat fish that you wouldn't be able to have out of season or that has been caught on the other side of the world. The convenience of a few bags of frozen fillets, shrimp and mixed seafood cocktail in your stock makes cooking fish very simple. Smoked haddock is one of my favourite meals and I often think I fancy a fillet cooked in milk with some bread and butter at odd times. If I've got a bag of frozen in stock, then I can have it there and then. As another positive, I find that frozen fish does not smell quite so much - fresh fish can really affect your other shopping when you're getting it home. Check the pack details to see if there are any additives. Shrimp (prawns UK) will normally have a 'glaze' which is included in the weight. There will be a lower defrosted weight when the glaze melts. Do not refreeze frozen fish without first cooking it. You'll very likely get food poisoning. Fresh fish at the store may have been previously frozen and then defrosted for sale. The information is important to you if you intend to freeze it at home. Defrost fillets in the fridge prior to cooking. You can marinade in oil and herbs, season with salt and pepper whilst it's defrosting. You can quickly defrost fish or other seafood in cold water. Put it in a ziplock bag and submerge it. Don't use the microwave to defrost as it will begin to cook the flesh. Fish is quick to thaw, the pieces are usually small and it shouldn't take longer than 30 to 60 minutes even at room temperature. You can cook fish from frozen, you'll need to add a couple of minutes to the cooking time for each side. A bag of seafood cocktail makes a great paella style dish. Only defrost as much as you need - if you've taken out too much, cook it and return it to the freezer to use in fish cakes, pies or kedgeree. A bag of fish pie mix is a great standby. It will generally have some salmon, shrimp, plain and smoked fish. Aim to use your frozen seafood within four to six months of purchase. Keep a shelf of your freezer specifically for fish. If you don't have the space, put it in a bag of its own. It can smell a little after a while. That's not the fish, but the fact that you're handling the bag and the fillets and the smell comes from wet hands. Fresh frozen - means the fish (or your turkey for instance) haven't been frozen for very long. It would have been frozen within a short period of being prepared, but not sat in a freezer for weeks. Frozen fresh - means that it was frozen quickly after being processed. It may have been frozen for a period of time, weeks or maybe months. You can use it any way you'd use fresh, but there are some advantages of convenience, being able to decide 'oh I fancy some fish tonight' and it's sat there in your freezer. Curry - a bag of shrimp (prawns UK) make superb curry. Try adding some hard boiled eggs to it as well. Pie mix - make a white or parsley sauce then bake in the oven either topped with mashed potato, a pastry pie or crumble topping. Steamed, poached, baked can all be done from frozen, no need to defrost, just add some time to the cooking. Deep fried in batter - best to defrost thoroughly before battering but not essential. It will steam just as well inside the batter as fresh fish. 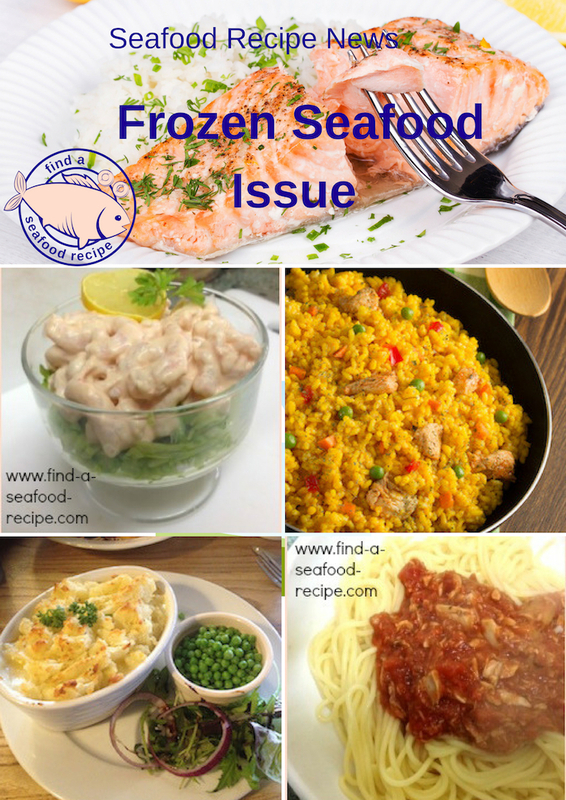 You can buy frozen seafood mail order or from your grocery store. Amazon is a huge marketplace and you can find everything you could possibly need. Crab, lobster, mussels, shrimp, cod, haddock, tuna, sushi, sea bass, salmon fresh and smoked, trout, mackerel, mixed seafood, halibut, turbot, mahi mahi, octopus, swordfish, mussels, battered fish, crab cakes, fish pies, pates and more - the list goes on and on! The biggest advantage as I see it, is you can compare prices and quality from different suppliers all in one place. I can't think of any way of doing that as easily. Follow this link, enter 'frozen seafood' in the search bar and prepare to be amazed at the power of Amazon. The biggest suppliers are now using Amazon to sell their products. Due to the fact I live in the UK and might you live thousands of miles away, I can't give any specific recommendations, but I can give you a few tips. Check the delivery charge. Something that appears a reasonable price may become expensive. When looking at the reviews, the one stars are important too. See how old they both are to judge how relevant they may be. Don't get carried away ordering loads, bear in mind how much freezer space you have! Check how the fish is packaged - is it individual portions or a big box? If it's a big box, make sure you have packaging and time to split it down for your freezer. In the navbar on the left you can select 'brand' which will give you a list of the suppliers. Most suppliers ship overnight with specially adapted ice packaging. Check the details of that. I'm not going to go mad here as virtually any seafood recipes you find can be used for frozen fish. If you're not sure, simply defrost it prior to embarking on the recipe. It'll only add a short time to preparation and then you can use it as though it was fresh. Just don't refreeze unless you've cooked it first. 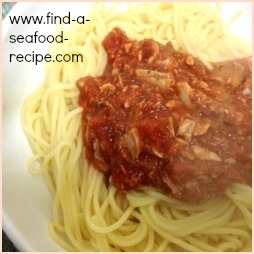 A Seafood Marinara - this sauce has a long list of ingredients BUT you could use a bag of seafood medley or cocktail to get a great sauce. Serve this over spaghetti or use it for a lasagne or pasta bake. Quick and easy. 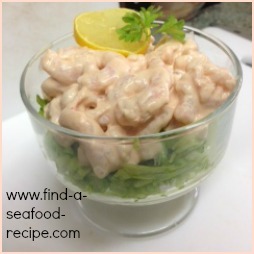 This is a simple Seafood Rice recipe. You can use defrosted shrimp, a medley or cocktail, fresh cooked fish leftovers or even a couple of cans if you like. It's seasoned with curry paste (if you only have powder, mix that with a bit of oil to become a paste) and is quick to put together. 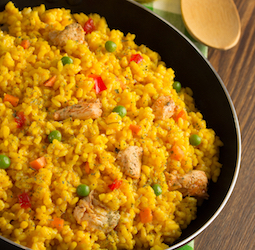 Or for an easy seafood paella, go to the second recipe here. Shrimp Cocktail is a lovely appetiser. You do need to defrost the shrimp first. Follow my step by step tutorial to see how simple it is to make this. 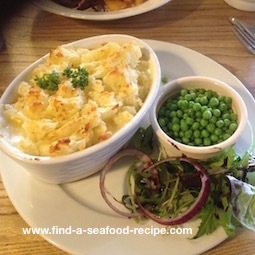 A Fishermans Pie is the perfect example of using a bag of frozen fish pie mix. It generally will contain salmon, white fish such as cod and smoked fish all cut into cubes. Some 'luxury' mixes will have a few shrimp in but you can always add a handful out of your own bag meaning you don't have to buy the more expensive frozen seafood mix. I personally like some hard boiled egg cut into quarters nestled in amongst the fish pieces. I love the combination of fish and egg.